Provide comfort for the family of Patrocinio Banayos with a meaningful gesture of sympathy. Patrocinio (Pat) Canero Banayos passed away on December 5, 2018, in Winnipeg, MB at the age of 71 after a battle with cancer. 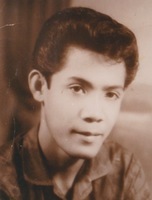 Pat was born on April 3, 1947, at Ilocos Norte in Northern Philippines. He is predeceased by his mother Bernandina Canero Banayos, his brother Warlito Banayos, and sister Georgina Peck. He will be lovingly remembered by his wife of 43 years, Lucita Villanueva Banayos; his children Liezl, Oliver, Florence, and Carol; his grandchildren Carmen and Logan; and numerous family in Winnipeg and around the world. Pat loved reading, music, politics, bible scriptures, Nike shoes, and intellectual conversations laced with humour, wit, and grit. He was a regular at shopping centres where he would walk around and meet his friends. Pat loved going on dates with Lucita for walks, drives, and movies together. Pat loved spending time with family and his grandchildren and they are very grateful that he remained hopeful, cheerful, and demonstrated strength and resilience during his most painful times. The love he gave during his last few weeks of his life will be forever remembered. Pat's family would like to thank the staff at Riverview Health Centre for their compassionate care, and everyone for their continued help and support. Lamay/Viewing will be held at Mosaic Funeral Chapel, 1839 Inkster Blvd., Winnipeg, MB. on Sunday, December 16, 2018. Lamay will commence at 6:00 p.m. Vigil Prayers at 7:00 p.m.
Rev. Father Rainerio Sarce officiating. Funeral service will be held on Monday, December 17, 2018 at Mosaic Funeral Chapel, 1839 Inkster Blvd., Winnipeg, MB. at 11:00 a.m. ,Rev. Father Rainerio Sarce presiding. Interment will take place at Chapel Lawn Memorial Gardens, 4000 Portage Ave., Winnipeg, MB. To send flowers in memory of Patrocinio Canero Banayos, please visit our Heartfelt Sympathies Store. We encourage you to share your most beloved memories of Patrocinio here, so that the family and other loved ones can always see it. You can upload cherished photographs, or share your favorite stories, and can even comment on those shared by others.